How does CART compare to NASCAR? Over the past few seasons, I've had the opportunity to cover several NASCAR races for AutoRacing1. Last weekend, a unique opportunity arose when I traveled to Nazareth, Pennsylvania to photograph the CART race. I thought it would be interesting for race fans to see a relative comparison of the aspects of the two series. First off, let me say that I volunteered to go to Nazareth not knowing exactly what to expect. I decided not to pass up the opportunity since the CART race was being held at what we consider one of AutoRacing1's "home" tracks. Additionally, it had been announced that CART would drop Nazareth from next year's schedule, potentially making this the last time I could see CART hold an event at this particular track. While I have been following NASCAR and stock car racing for a long time, the last open-wheel event I attended was the Marlboro Grand Prix in 1989 in Meadowlands, New Jersey. Last year I saw the NASCAR Featherlite Modified series run at Watkins Glen. Technically they are considered open-wheel cars, but that's about the only similarity to a Champ car. There most certainly are many differences between the CART and NASCAR racing series. Surprising to me, though, was the number of similarities. Of course I have only this one race from which to draw my comparisons. And this particular race was on a one-mile oval, on which NASCAR Busch and Craftsman Trucks also run. Some of my comparisons may not necessarily apply to CART's road courses and overseas races. Let's start with my first impressions at the track. When checking in for my media credentials, CART's registration procedures are virtually identical to NASCAR. There is a separate parking area set aside for the media in the infield area. Special credentials are required for accessing the paddock, garage, pits, media center and hospitality areas, which was a familiar procedure for me. This particular track has no permanent garage structure, unlike most tracks on the Winston Cup circuit. At this track, CART teams set up their own outdoor work zones, under tents and awnings, and adjacent to the car haulers. This provides ample room to work on the vehicles, and doesn't require the workers to haul tools to a garage area. Many NASCAR garages are somewhat cramped for space. This can be partially attributed to the larger size of a stock car and the significantly higher number of race teams participating in the race weekend. Sponsors had a big presence in the paddock area at Nazareth. All the major teams had a hauler or trailer with adjacent covered facilities to wine and dine clients and guests of their sponsors. I was able to partake in a couple of meals at one of the hospitality tents, and I must say that the food was excellent. We're talking fish, pork chops, and prime rib, not hamburgers and hot dogs. At NASCAR events, many hospitality areas are located in a separate area outside of the garage proper. At Nazareth, there are no physical boundaries between the team's work areas and hospitality suites, other than movie theater style ropes. In CART, there are only 28 cars/sponsors vs. 43 for NASCAR. It would be difficult for NASCAR to supply enough room for 43 team/sponsor facilities within the garage area. The pit area looked relatively similar, except each pit has more room during a CART event. That's one advantage of having only 25 to 28 Champ cars versus 43 NASCAR qualifiers. One of the first things I noticed is that CART fuels their cars via a hose attached to an elevated fuel tank, while NASCAR utilizes 11-gallon hand-held fuel canisters. The pit stalls for both series are configured with an elevated sitting platform equipped with computers to monitor the car's performance. While CART uses different storage containers for spare parts and equipment, the concept is virtually the same as NASCAR. As at any track, tires lay neatly at the back of the pit, ready to be changed in and out during the next pit stop. NASCAR assigns race day pit locations based on qualifying performances. The pit locations for Champ cars are driver's choice based on the qualifying from the previous race. At most tracks, two-car CART teams try to select adjacent pit locations. This rarely ! ! occurs in a NASCAR event, where owners are not limited in the number of racecars they can field. The two series differ the most when comparing the Winston Cup and Champ cars. The only things these cars have in common are four tires, a steering wheel, an engine and a timing/scoring transponder. Forget the old Cheech and Chong movies, because Champ cars are the real low-riders. The tallest part of the car is the rear wing on the back, and that only comes up to about waist level while standing next it. The driver sits in the "tub", in which the bottom is only a couple of inches off of the track. The front of a Champ car has a small stabilizing wing that adorns each side of the nose cone. And they have something else stock car fans don't see at a race - side view mirrors! NASCAR fans may think it's difficult for drivers to get in and out of a stock car because of the roll cage, small door opening and safety netting. In reality, it takes only a few seconds for Jeff Gordon or Dale Jarrett to wriggle their way into and out of the cockpit, even while wearing a HANS device. Conversely, it is quite an undertaking to get a CART driver situated in his car. I liken the procedure to the lowering of the robot R2D2 into the spaceship cockpit in the Star Wars movie. The driver must stretch his arms forward just to have enough room to squeeze his shoulders down into the seat. Once situated, all you see of the driver is his helmet and his hands. Winston Cup drivers may have spartan cockpits, but they are mansion-like in size compared to an open-wheel car. There is no open space in a Champ car as the driver fills up every remaining square inch. The mechanics of the cars are totally different. NASCAR uses normally aspirated pushrod engines and high-octane gasoline, while Champ cars have turbocharged engines that burn methanol. CART allows extensive use of computers to monitor and operate the racecars, even providing drivers the ability to make changes to the car's suspension and engine management settings during a race. The only electronics in a Winston Cup car are the ignition and the in-car camera equipment. All changes to a stock car are done during pit stops by making manual changes to the trackbar, tire pressure and spring rubber. If you've seen the movie DRIVEN, you know how sophisticated the Champ car steering wheel is. The dashboard and steering wheel is one integrated unit, and can tell a driver his instantaneous speed in large LED numbers. Stock car drivers must rely on analog tachometer speeds to calculate their speed down pit road. Another key difference is a 'crash box.' This unit measures ! ! many things about a car when an accident happens so CART and the team can analyze the data and make the cars safer. They can tell how many g's the driver experienced during a crash, how far he was depressing the accelerator and how much he turned the wheel in the minutes leading up to and including the accident. NASCAR could learn a thing or two from CART in this aspect. The cars sound much different while both idling and running at speed. Stock car engines generate considerably more decibels. At most NASCAR tracks, ear protection is recommended to prevent hearing loss. If you've ever been in a Winston Cup garage and someone unexpectedly starts up an engine right behind you, you're more than likely going to have to go change your shorts. While not quiet, Champ car turbocharged engines produce a less violent, slightly higher pitched sound, and they are not nearly as loud during ignition. The smell of burned methanol seemed less notable than the pungent odor of expended 76 racing fuel. Compared to Champ cars, stock cars are rolling billboards. This is due to the difference in size and shape of the cars. Champ cars have enough room for one or two major sponsors, with one ad on the body and one on the back wing. It is also difficult to see some Champ car numbers from a distance. Conversely, you can see the advertisements and number on a stock car from the next county. The cars are completely different, but what about the drivers? By first looks, you may not be able to discern drivers of the two different series. Racecar drivers in general seem to be smaller than average. There of course are exceptions to the rule. 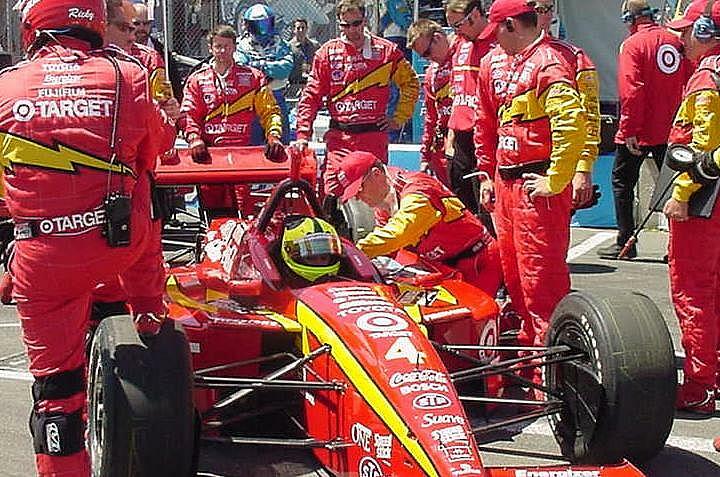 Paul Tracy appears to be the Jimmy Spencer of CART, being taller and weighing more than most other drivers. There are two major differences with CART drivers, the first of which is their young age. Michael Andretti is one of the oldest drivers at age 38. Most of the others are less then 30 years old, with Scott Dixon, the Nazareth winner, being only 20. There is no Bill Elliott or Dave Marcis in CART. If you listen to the drivers during interviews, you get an immediate feel for the international flavor of competition. While NASCAR drivers are almost exclusively from the United States, most CART drivers are from other nations. Brazil, Canada, Japan, New Zealand and Sweden are just some of the countries represented.! ! Sitting in the media center, you get to see and hear a veritable United Nations of reporters at a CART event. The pre-race festivities were similar to a NASCAR event. 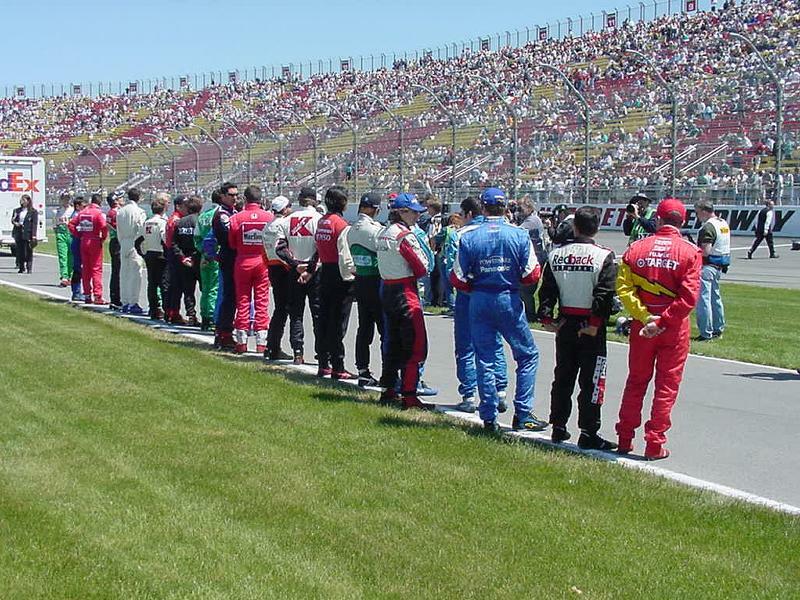 Driver introductions and multiple high-speed pace car laps must be common to all racing series. The race itself brought about some noticeable differences between the racing series. The CART race was restarted single file at Nazareth, as opposed to two abreast only on the initial start. There's no doubt in my mind that stock cars are fast, especially around high-speed ovals and superspeedways. But if you consider stock cars fast, then Champ cars are pure lightning on an oval. When I sat high up in the stands to take photographs, the cars seemed to be glued to the track, similar to running toy slot cars at full throttle with no thought of them coming off the track. The pole sitter at Nazareth turned a qualifying lap speed in excess of 170 mph, some 25 mph faster than the Busch series. And this is certainly not a big track with long straight sect! ! ions. The Champ cars were so fast they almost looked surreal, like my eyes were playing tricks on me. I can't even imagine these cars racing in Texas at 240 mph, and can relate to the argument that they don't belong on that type of high-banked oval track. 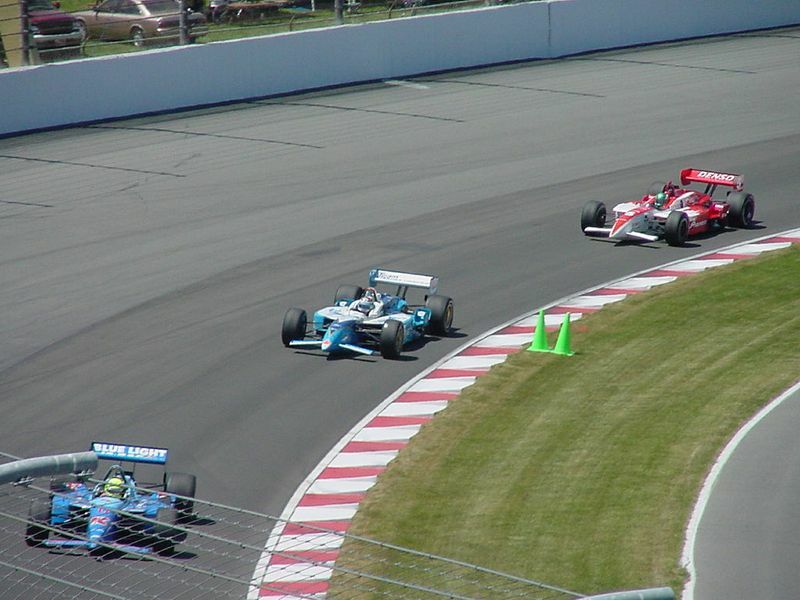 While impressed with the Champ cars and the talent of their drivers, I was less enamored by the race itself. In general, there was little action on the track during the sub-two hour race. Passing is very difficult even for the Busch cars at Nazareth, and it is near impossible for the open-wheel cars. There were stretches of 30 laps or more where there were no changes in the leader board. The use of the Hanford wing to slow the cars down creates dirty air, preventing someone from pulling up close in preparation of a pass. Certainly the opportunities for passing are increased when Winston Cup cars run two and three-wide. In addition to a few spinouts, the only major accident occurred when one car clipped another trying to pass through a turn. 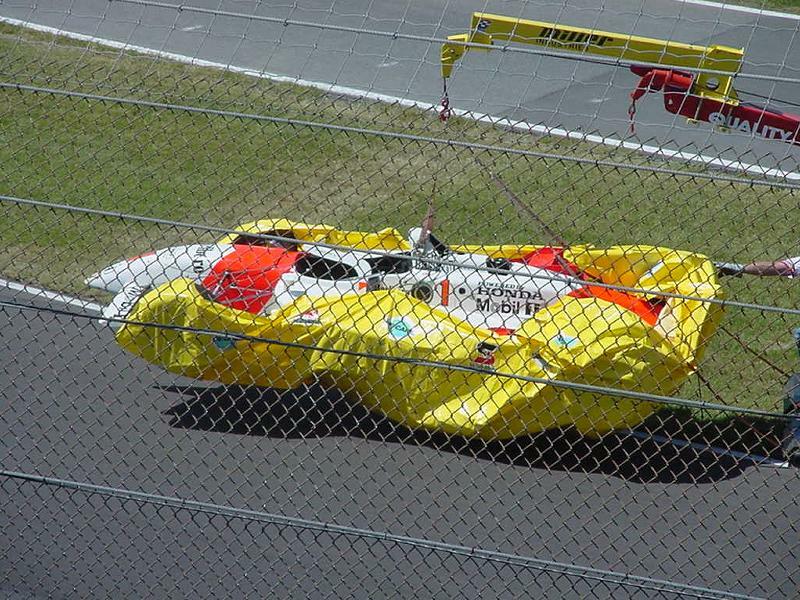 When an open-wheel car is involved in an accident, their race day almost always comes to an end. Tow trucks lift the cars up completely off the ground and carry! ! them back to the garage area. Stock cars involved in crashes are much heavier and are towed or lifted onto a flat bed. Pit stops are a different animal in CART races. The refueling process is usually the critical process, mostly because of the quickness of the tire changes. Champ car wheels do not have five lug nuts and do not require a jackman. The jacks are built into the vehicle and activated by an air pressure hose inserted in the rear of the car. 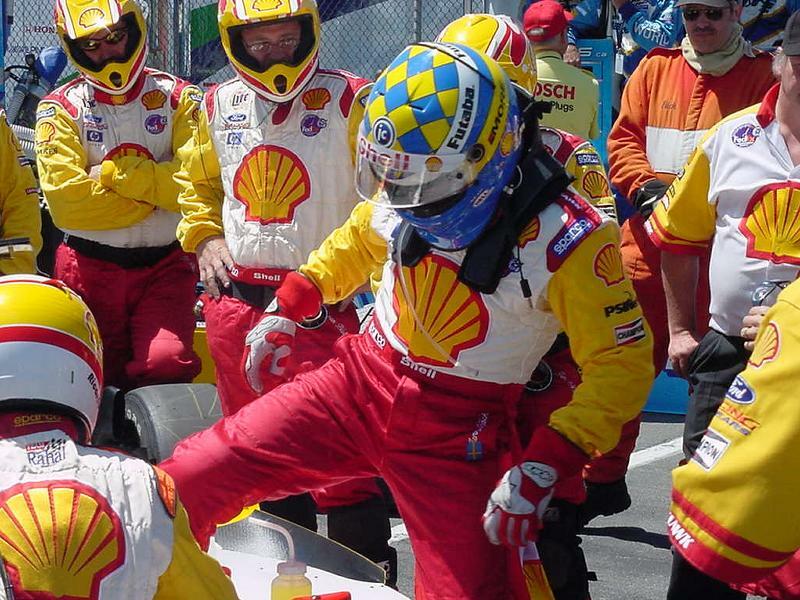 While CART pit stops are impressive to watch, Winston Cup races are often won or lost in the pits, and the best pit crew teamwork can gain the upper hand in a race. CART pit stops appear more sterile, while all hell can break loose during a NASCAR pit stop. I didn't see any loose lug nuts, errant rolling tires or stuck catch cans during this race. There is an impression of CART fans as being a wine and cheese type crowd. Granted this race was in Nazareth, but I didn't see any evidence of this. Looking through the stands, I couldn't really tell whether this was a NASCAR or a CART event. As a matter of fact, I saw fans with hats and shirts from both racing series. The only difference I noticed was that the fans at this race were a little more reserved than I'm used to. Nonetheless they were avid fans of a particular driver or team. Another major difference in the race weekend was the number of people who only attend on race day. Although the CART race was supported by USAC Silver Bullet and Toyota Atlantic races, the crowds for Saturday and Sunday were sparse. On a typical NASCAR race weekend, thousands of fans camp at the track for a three or four-day party. Apparently this is only the case for CART oval races. At their road and street races, the stands are usually pretty full all three days. Both of these two racing series have their positive and negative aspects. While I will always be a fan of stock car racing, I certainly gained an appreciation for the CART series this past weekend. And although I'll stick to covering the Winston Cup circuit because that's my true passion, this probably won't be the last CART race I attend. I guess deep down inside I just like to see cars go fast, whether they have fenders or not. I've been told that Champ cars were designed and built to excel on road courses, and I would tend to agree after watching them on an oval. My dream weekend would consist of watching a double header of Winston Cup cars and Champ cars racing at Watkins Glen. This would allow me to make an even fairer comparison between the two series. I'm hoping that CART and International Speedway Corporation can make that happen in the near future. Something tells me I'm not the only race fan that would buy that ticket package in a heartbeat.